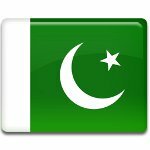 The national flag of Pakistan is a green field with a white crescent moon and five-rayed star at its center, and a vertical white stripe at the hoist side. The green color represents Islam, the white color represents religious minorities, and the crescent and star are the symbols of progress and light respectively. The flag as a whole symbolizes the country’s commitment to Islam and the rights of religious minorities. The flag of Pakistan is based on the flag of the All-India Muslim League, a political party that existed in the British Indian Empire. It strove for the partition of British India and the establishment of a separate Muslim-majority nation-state. The flag of the All-India Muslim League, in its turn, was inspired by the flags of the Delhi Sultanate, the Ottoman Empire, and the Mughal Empire. The national flag of Pakistan is raised on flag flying days, including Pakistan Day (full-mast), death anniversary of Muhammad Iqbal (half-mast), Independence Day (full-mast), death anniversary of Muhammad Ali Jinnah (half-mast), and birth anniversary of Muhammad Ali Jinnah (full-mast). It is hoisted every morning at many schools, government buildings and offices to the sound of the national anthem.